Believe it or not, the relocation of Daum Communications, the second largest online portal in Korea, to Jeju was triggered by a single employee who arrived late to a meeting. Lee Jae Woong, the founder and then CEO of the company, was trying to understand why this new employee, fresh out of college, was late for an annual early-morning meeting. Then he heard that he had to spend four hours a day simply commuting from his suburban home in Gyeonggi province to the company’s Seoul headquarters. Deeply disturbed by the apparent irony of commuting several hours a day for only eight-plus hours of work at the office, Lee one day asked on the company's intranet what would happen if Daum moved its head office to a local city. Lee’s suggestion sparked a cascade of heated debate and excitement among the company’s some 1,000 workers. Thus began Daum’s long journey to Jeju. In April 2004, one month after Daum and Governor Woo Keun Min signed an MOU regarding the company’s relocation to the island, 16 Daum software developers were sent to Jeju. They were not asked to develop a new Web service, however. Instead, they were to beta-test the feasibility of commuting to the company’s new head office on the island, simulating their new life as immigrants on Jeju. Daum’s Lee Jae Woong and some business owners seem to operate on the theory that “happy employees make happy customers [which] make happy owners.” So after six years of non-stop experiments, did the happy employees of Daum’s Jeju head office really make its owner happy as well? “You know what? Guys here chat all the time [with] each other on the net, even to their cubicle neighbors,” Choi Jeong Hye, the company’s communication officer, told The Jeju Weekly. She was trying to convince me that in the highly connected work environment of many dot-coms, your online doppelgänger can do much more than you think. The company’s developers and portal service managers rely mostly on online meetings and video conferences to coordinate work with their Seoul counterparts, Choi said, though occasional trips to the Seoul office are inevitable. In fact, I found Cisco’s cutting-edge video conference system in the meeting room where the interview took place. Her remark reminds me of the euphoria that had surrounded the Internet revolution circa early 1990s, when many believed that the spread of broadband Internet services and the cyber-workplace would eliminate the need for long commutes to city centers. Instead, home offices would rise to be the new gold standard of everyday business, nullifying the dominance of brick and mortar stalwarts. It seemed true at first. Second Life, for example, complete with a virtual Reuters office and its own newspaper covering the day-to-day gossip of the metaverse, looked like a new frontier that might someday supersede the flesh and blood attractions of the real world. After 20 years of online intoxication, however, people are waking up to the rude reality of this strange 21st century. The so-called ‘knowledge industry,’ once hailed in Korea as a new hope to weaken the seemingly invincible power of the political-economic-cultural leviathan that is Seoul, proved to be the opposite. According to the latest research, the dot-com boom that swept through the Korean economy after the Asian financial crisis in late 1990s actually strengthened the power of Seoul. Seventy-five percent of new high-tech jobs created were within or near the city. In fact, Daum’s young developers and service managers were somewhat worried about the potential disconnection (whether real or psychological) from the ever-growing economic powerhouse that is Seoul. Furthermore, almost all of the key advertisers that Daum relies on for ad revenue are headquartered in Seoul. Daum’s answer to that anxiety was the dual office system. The company’s sales and marketing staff will still work from the Seoul office even after relocation is completed, with the company’s official address being registered in Jeju. If any employee insists on staying in Seoul, he or she will be given a post in a division in the company’s Hannam-dong, Seoul office. Choi estimates that a good number of its employees will still work in Seoul well after the completion of the relocation. Daum’s rather smooth relocation to Jeju was helped partly by the industry’s unique job culture: dot-com types change their jobs every three years on average. If you are going to stay on with one company for fewer than three years, why not choose Daum for a change? They might consider a stint at Daum an extended trip to Jeju. It should also be noted that the average age of a Daum employee is 30, with the majority of employees having no children or just young children. Thus, higher education is not an immediate concern for them. Both factors may have helped Daum make the transition to Jeju less bumpier. Choi points out that Jeju’s calm and natural environment is good for the company’s online service developers as they testified time and time again that they can focus on their work more easily here than in Seoul. To prove that its relocation to Jeju was a prescient move, Daum needs to show that its Jeju office is a profit center. It is good then that recently, after a brief slump in 2004 and 2005, Daum is producing record sales. To see the formation of the much anticipated IT cluster on the island any time soon, Daum needs to see the brand equity of Jeju rise as well. Hopefully that equity will be powerful enough to lure other dot-coms inside and outside of Korea to the island. Is it pure coincidence then that the number of news links about Jeju on the portal's main page has jumped recently? In fact, Daum has paid special attention to Jeju-related content there. The company’s Road View service (Daum’s version of Google Street View) team has literally walked hundreds of extra miles to cover Jeju’s 18 Olle trails, drawing online glares from jealous residents in other provinces. Choi believes however, that Daum’s most powerful testimony for the island's attractiveness as an alternative IT cluster (second to Seoul) is its very physical presence on the island. Daum’s Global Media Center in Jeju greets about 5,000 visitors a year, making it a silent advocate for the island’s vision of luring a clean IT industry. 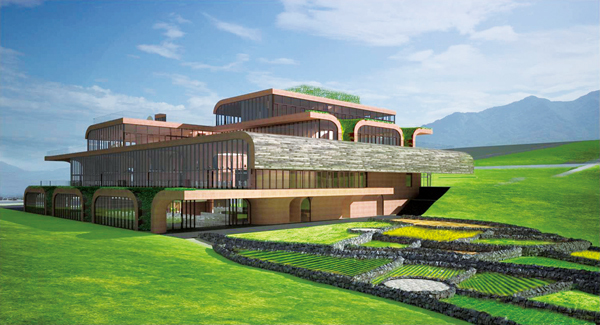 Daum’s relocation to Jeju, as outlined in the original master plan, is about one year behind schedule, Choi said. It is critical for Daum and for Jeju that the company perform well in terms of page views and generation of advertising revenue. One might say that Daum and Jeju are inseparably connected with each other, cruising on the same boat in both cyberspace and in real space.